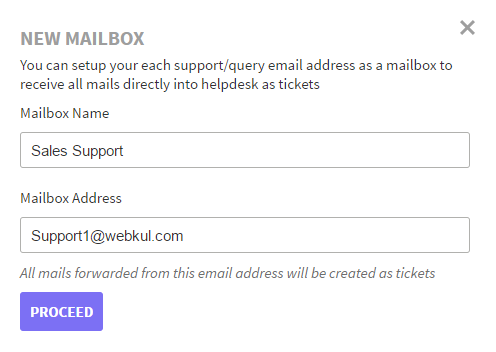 Mailbox feature allows e-mails which are sent to any specific e-mail address to be automatically imported to the support ticket system as a ticket. Now, the owner or the agent can work on that ticket and resolve the issue of the customer. When the mail gets converted into a ticket then Mail Subject becomes the title of the ticket and mail content becomes the ticket content. On the ticket, you can see the email address of the sender, name, date & time. What are the advantages of Mailbox? 1. 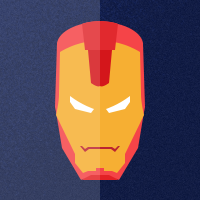 It will automatically convert your emails into the support ticket in the UVdesk. 2. It will reduce the response time of the support agent as the agent can see the tickets in the UVdesk Panel. There will be no need of checking inbox for new emails. On the Dashboard, you will see "CHANNELS" menu and under it, you will find "Mailbox". Click on the "Mailbox" Icon and then you will be redirected to a new page. In the new page, you will see a list of existing Mailboxes and "New Mailbox" button. Hit the "New Mailbox" button and then a pop-up will come up. Enter Mailbox Name & Mailbox Address and then hit on Proceed button. After that, another pop-up box will come where you have to copy the secret mail provided which you will use for email forwarding for different email services like Gmail, Outlook, Fastmail, Yahoo, Zoho Mail, etc. 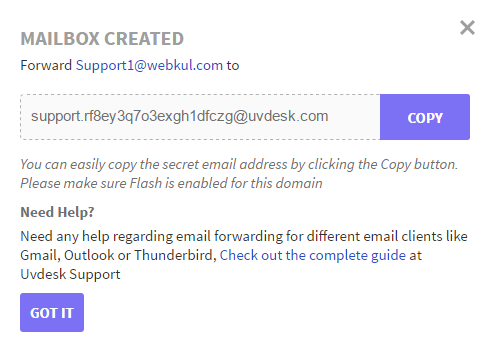 UVdesk - How to configure Yahoo with Mailbox?